Terminology applied to the Chalk of England. Reference to the relevant Figure and column numbers showing the quoted scheme graphically will be given subsequently in the form [Fig.x/y] where y refers to the column number. P900807. The following text relies heavily on the following documents, but has been modified, to remove ambiguity and bias; a personal communication between Prof. Andy Gale and Peter Allen prior to the Chalk Lithostratigraphy meeting at Keyworth (Gale, 1999, pers. comm. ); a review of the Chalk Group for Yorkshire and Lincolnshire prepared as a BGS Technical Report (Sumbler, 1999); the paper by Bristow et al. (1997); reviews of the Chalk of the South and North Downs (Aldiss, 2002) and (Hopson, 1999) respectively; and the most recently published Geological Conservation Review book by Mortimore et al. (2001). 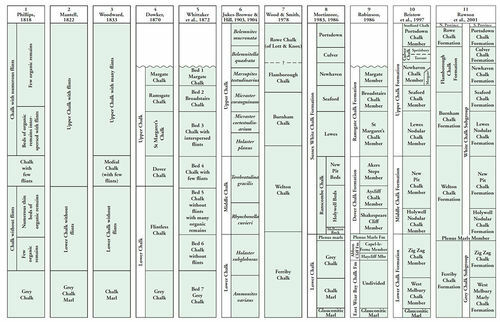 The earliest lithostratigraphical divisions of the Chalk were provided W Phillips (1818, 1821) for Kent, by Mantell (1822) for Sussex, and by Woodward (1833) for Norfolk [Figure P900807, Columns 1, 2 and 31 respectively]. These schemes were based primarily on the clay content of the chalk and the relative abundance (or absence) of flints. These early classifications had a degree of agreement although the boundaries between units chosen by the authors differed. These authors recognised a ‘marly’ lower unit termed the Grey Chalk, Grey Chalk Marl or Chalk Marl but always overlain by the Lower Chalk distinguished by its hardness and absence of flint. This lower ‘marly’ unit corresponds approximately with the subsequently devised ‘traditional scheme’ term of Chalk Marl (see below and [Fig.3/1]) with or without the lower part of the Grey Chalk included (also part of the ‘traditional scheme’ nomenclature but not to be confused with the “Grey Chalk” of W Phillips, 1818). Each of these schemes introduced an “Upper Chalk” which was characterised by numerous flints. W Phillips and Woodward separated a unit at the base of the Upper Chalk as their Chalk with few flints or Medial Chalk. Similar schemes were utilised by Bogg (1816) for Lincolnshire and by J Phillips (1829) for Yorkshire. It is interesting to note that the Lower – Middle Chalk boundary at the base of the Melbourn Rock, considered to be so distinctive nowadays, did not appear in these schemes. The use of a ‘Lower Chalk’ (incorporating the Chalk Marl/Grey Chalk) without flints and an ‘Upper Chalk’ with flints continued for much of the remainder of the 19th century (e.g. Whitaker, 1865b; Dowker, 1870) [Fig.2/4 and Fig.5a/2]; (e.g. Whitaker, Bristow and Hughes, 1872) [Fig.2/5 and Fig5a/3]. Sharpe (1853) was the first author to revise this system by placing the Chloritic Marl and the Chalk Marl within the Lower Chalk, and establishing a Middle Chalk. characterised by a sparse fauna. In 1880, Jukes-Browne described the Melbourn Rock in Cambridgeshire, and Penning and Jukes-Browne (1881) used this feature-forming and easily traceable unit to divide their Lower from a new Middle Chalk unit. They also determined that a higher hard rock band, the Chalk Rock, containing a characteristic fauna and preservation style, formed a similar feature separating the Middle from the Upper Chalk [Fig.3/1]. An integrated bio- and litho-stratigraphical scheme (the ‘traditional scheme’ herein) was developed in memoirs of the Geological Survey and presented in the seminal works of Jukes-Browne and Hill (1903, 1904) [Fig.2/6, Fig.5a/6, Fig.5b/4 and Fig.6/4] (The 1904 volume also contains a comprehensive bibliography of published works on the Chalk in the period 1628 to 1903). It is these two volumes that formed the basis of the Geological Surveys mapping of the Chalk of southern England until the 1990s and are the basis for the Geological Society’s correlation of the ‘Southern Province’ Chalk (Rawson et al., 1978). Certain aspects of the ‘traditional scheme’ were, however, difficult to apply in mapping terms to the Chalk of Lincolnshire and Yorkshire and the Middle – Upper Chalk boundary, in particular, was a matter of some conjecture. Rowe (1900 to 1908), working from a biostratigraphical premise, did not recognise the separate Middle and Upper Chalk divisions as they were based on what he saw as an ephemeral and diachronous lithological feature (the Chalk Rock). Instead he used the term "White Chalk" to include both Middle and Upper Chalk of the ‘traditional scheme’. This concept of the term “White Chalk” was accepted by Mortimore (1983, 1986) [Fig.2/8, Fig.3/3 and Fig.5a/9], if on somewhat different criteria, and he formally introduced the lithostratigraphical term of the "Sussex White Chalk Formation". Bristow et al. (1997) [Fig.2/10, Fig.3/5, Fig.5a/10] reintroduced a threefold terminology with Lower, Middle and Upper Chalk classed as Formations, each redefined to include slightly different strata than before and designed to provide a basis for mapping and a connection to the ‘traditional scheme’. These formations were further divided into newly defined members. The threefold division was justified by using the base of the Lewes Chalk Member of Mortimore (1983) that could be widely mapped in southern England as the base of the Upper Chalk. Although it was recognised as a diachronous boundary marked by the onset of distinct nodularity, it corresponded approximately with the old Middle – Upper Chalk boundary. Gale and Hancock (1999), in correspondence, argued that this was an arbitrary division and Middle and Upper Chalks defined thus lacked lithological integrity. Their arguments were strongly refuted (Bristow et al., 1999) in correspondence in the same volume. The first attempt last century to separate the litho- and bio-stratigraphy of the Chalk was by Wood & Smith (1978) who erected a new fourfold lithostratigraphical scheme for Yorkshire and Lincolnshire [Fig.2/7 and Fig.6/5]. They established the Ferriby, Welton, Burnham and Flamborough Chalk formations. The Ferriby Formation is dominantly white chalk with marly partings overlying the Red Chalk. A thin but distinctive Black Band at the base of the overlying Welton Chalk Formation which commences with a marly unit (the Plenus Marls ‘Member’ of Witham, 1991 and others) is overlain by massive to thickly bedded chalks with flint nodules. The succeeding Burnham Chalk Formation comprises thinly bedded chalks with tabular and semi-tabular flints overlain by the essentially flint-free and softer chalks of the Flamborough Chalk Formation. This paper is particularly important in that it established the distinctive and separate lithological succession of the Chalk in Yorkshire and Lincolnshire for the first time. Lott and Knox (1994) [Fig.11/4] working in the North Sea introduced the term Rowe Chalk Formation to cover the very highest Chalk concealed beneath Quaternary deposits in the Hornsea area and immediately offshore. Sumbler (1999) described these beds, based on geophysical logs from boreholes, as 70m or so of flint-bearing chalks characterised by the inferred presence of Belemnitella mucronata (a species commonly reworked into the overlying Quaternary deposits) and also indicated that still younger beds were present offshore. In November of 1999 a meeting held at BGS Keyworth, co-sponsored by the BGS and the Stratigraphy Commission of the Geological Society, brought together experts on the Chalk to standardise the nomenclature on BGS maps and to act as a framework for the new Cretaceous Correlation publication of the Geological Society. Agreement was reached, with some reservations, on a framework to guide future workers in Chalk research and the application of this should standardise terminology. It was agreed that the Chalk Group should be divided into a Grey Chalk Subgroup and a White Chalk Subgroup on a national basis. The base of the Grey Chalk Subgroup being everywhere placed at an erosional contact that marks the base of the Upper Cretaceous; and the base of the White Chalk Subgroup being everywhere placed at the base of the Plenus Marls Member. In addition the meeting agreed that there were sufficient lithological and faunal differences to sustain a lithostratigraphical nomenclature at formational level (and below) for a ‘Northern Province’ and a ‘Southern Province’ (see the table below). The agreed lithological framework from the Chalk Lithostratigraphy meeting held at BGS, Keyworth, on the 3-4 November 1999. (after Rawson, Allen and Gale, 2001). This accorded with the best practise of the BGS surveying activities at the time, with the proviso that the “Lower, Middle and Upper Chalk Formations” were abandoned; that the ‘members’ being utilised as mapping units (after Bristow et al. 1997) in the ‘Southern Province’ should be re-designated as formations; and that the Holywell Nodular Chalk Formation, newly created as a consequence, should include the Plenus Marls Member as its basal unit. A summary of that unified scheme, and its relationship to earlier schemes, is shown in Fig.2/11, Fig.3/6 and Fig.5a/11. Beyond formational level members of local significance, some of which may prove to be traceable over unexposed countryside and therefore deemed to be ‘mappable’, can be erected without the need for any given formation to be divided entirely into members. It is strongly recommended herein that local variations in lithology that are deemed sufficiently mappable and provide additional data on the structure and distribution of the Chalk be formally designated as members within the formational scheme erected here. To aid the understanding of the changes in terminology used in BGS publications over time, and the relationship between those terms and the unified scheme, a comprehensive Lexicon of informal/formal and current/redundant terms will be developed by BGS. It follows that as BGS maps come up for revision, whether in paper or digital format, the new terminology will be adopted. This page was last modified on 3 February 2015, at 14:48.